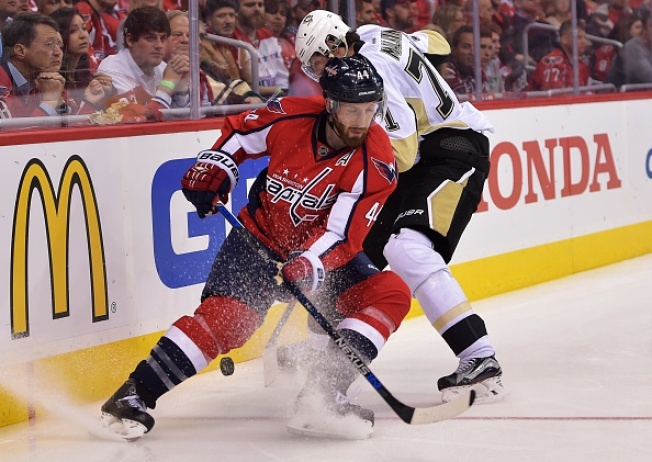 Washington Capitals defenseman Brooks Orpik was suspended three games for his late hit to the head of Pittsburgh Penguins defenseman Olli Maatta. Orpik will miss Game 3 Monday, Game 4 Wednesday and Game 5 Saturday. He'd be eligible to return if the series gets to Game 6 on May 10. Orpik hit Maatta in the head after the puck was gone four minutes into Game 2 Saturday and was given a two-minute minor penalty for interference. After a hearing with the NHL's department of player safety, the punishment was far more severe. Director of player safety Patrick Burke said Sunday in the video announcing the suspension that ``this hit is forceful, unacceptably high and excessively late.'' Orpik waiting a full second after Maatta released the puck for a shot and his ``significant head contact'' contributed to the suspension, as did Maatta's injury. ``No player should reasonably expect to be hit at this time and in this manner,'' Burke said. Maatta left the game and did not return. Coach Mike Sullivan said the team would probably have an update on Maatta's status Monday. The 21-year-old Finn has a concussion history dating to his time playing junior hockey. Pittsburgh coach Mike Sullivan expressed his displeasure with the hit after his team's 2-1 victory in Game 2 Saturday night. Orpik didn't have a rap sheet with the NHL but does have a reputation for playing on the edge. While the Capitals did not make Orpik available to speak to reporters after the game, coach Barry Trotz said he spoke with the defenseman about the hit. Trotz relayed that Orpik thought the puck was coming back to Orpik and that he didn't intend to hit Maatta like that. Trotz defended Orpik's character and style of play while acknowledging that whatever the NHL decides, the Capitals will deal with it. With Orpik suspended, the Capitals are without their most physical defenseman and a top penalty-killer. Orpik missed three games of the first-round series against the Philadelphia Flyers after he was concussed on a legal hit from Ryan White on April 18. The Capitals could turn back to Russian defenseman Dmitry Orlov, who was a healthy scratch in Game 2 after a defensive miscue led to a Penguins goal in Game 1, or to big Mike Weber, a Pittsburgh native they acquired at the trade deadline from the Buffalo Sabres. Beyond the Maatta hit, Orpik was up to old tricks Saturday night against his former team. The Penguins are familiar with Orpik's bruising style. It helped them go to the Stanley Cup final in 2008 and win it all in 2009. Asked if Orpik plays any differently with Washington than he did with Pittsburgh, defenseman Kris Letang said, ``Uh, no.'' Later in Game 2, Orpik knocked Letang's helmet off with a glove to the face after a whistle and continued to try to get under players' skin.